If you’re not busy flinging feathered folk at pig castles, you might check out these new Angry Birds tie-in books (from rovio.com, of course). 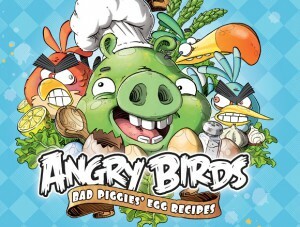 How best to describe Angry Birds: Bad Piggies’ Egg Recipes? Here, we’ll let them do it: “Be a pig for a day, no worries in the world, no Angry Birds trying to knock you down. The kitchen is your pigpen and life’s good! So go ‘head, crack an egg or two and fling your awesome self to new levels of egg-cellence with these easy and fuss-free (for the most part) recipes, addictively fun activities and impressive party moves. From the classics to off the wall, these top-secret egg recipes will fill your tummy and tickle your brain!” You heard ‘em. Also available are the Angry Birds Big Red Doodle Book and Angry Birds Big Green Doodle Book, filled with fun drawing activities for Angry Birds fans of all ages.